Use Paypal to pay and take up to 6 months to pay for them! We have Chaps for Sale Again. We can do "off the rack" sizes or you can have them custom made to FIT YOU! We have Ultrasuede, Smooth and RoughOut Leather with or without tooled leather tops, Pleather (look and feel like real smooth leather, with a much more affordable price tag!! We have top quality chaps and more budget minded chaps too. 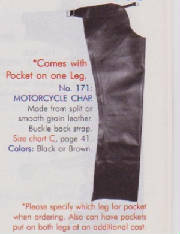 We can get you schooling chaps, rodeo chaps, chinks, cutting chaps and even motorcycle chaps! Call me and let's talk about getting your chaps ordered today! Lead Line Chap for our smallest ride. 2 concho back. Black only. Check out the below Chaps. They are good quality economical Show Chaps for 4-H, Open shows and more. 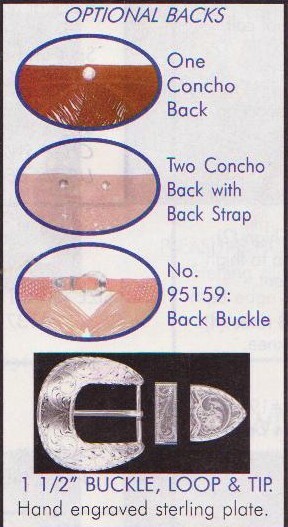 #422 Star Rider Child Western Show Chap ~ Equitation show chap with 4" fringe, heel drop and single concho yoke closure. Black split leather only. Size Small, Medium, Large and Ex-Large. Looking for Schooling chaps? Rodeo or Cutting Chaps? How about Motorcycle chaps? We have what you are looking for. Below is just a quick example; email or call for more photos and prices!! Sizes XSmall through XLarge and Custom Sizing Too! #229 Hand Stamped basket weave leather yoke show chaps. 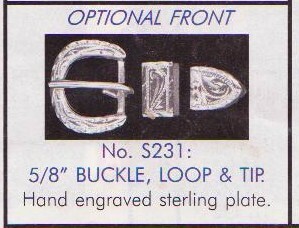 Comes with 1 1/2" silver plated hand engraved back buckle, loop & tip for back closure. Available in Split leather, smooth leather or ultrasuede material. Custom Sizes available in this chap. Extra fee for custom sizing. #240 Trim Line Show Chap. Features a modified heel drop, comes with choice of 1 (240-1) or 2 conchos (240-2) on back and 4" fringe. Available in split or smooth leather. Check out the below Chaps. They are good quality economical Show Chaps for Open shows and more. #429 Adult Western Show Chap. 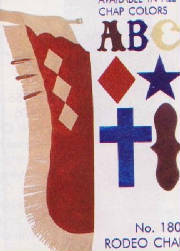 Split leather equitation show chap with 4" fringe, heel drop and tooled floral yokes. Black only. 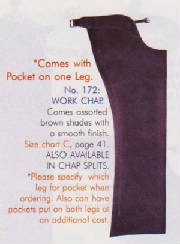 Below are some of the options you can choose to make your new chaps just right for you!! 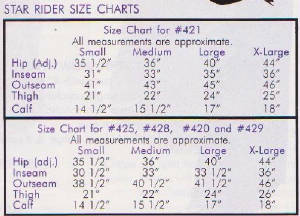 We will make the chaps you want to your specified measurements. You give us the measurements based on our chart we will email you to assist you in taking accurate measurements. The cost of custom made vs. 'off the rack' sizes starts at $50 extra over the cost of 'off the rack' and goes up depending on size needed. There is an extra charge for thigh measurement of 28" and more. Ask for details. 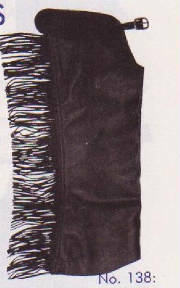 ALL CUSTOM CHAPS ARE FINAL SALES SO MEASURE CAREFULLY! Have another person measure you to be accurate. 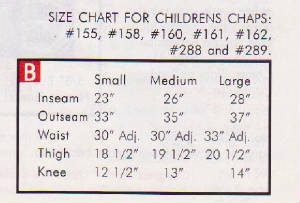 Wear the clothes you will wear under the chaps and the boots you will wear while being measured.